Coverage: 1-2m2 per can depending on spray thickness. Di electrical strength in excess of 1000v. 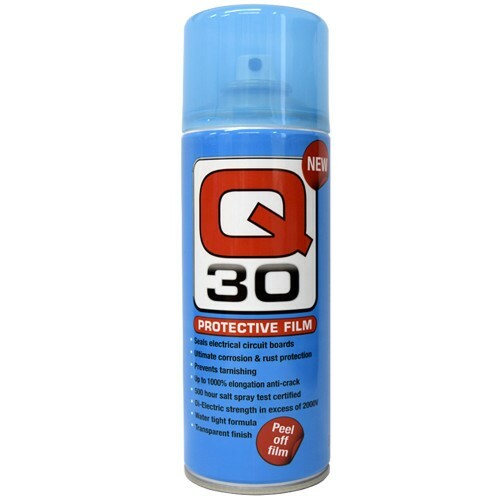 Q30 is a brand new super protective film. This protective film is a must-have in the electrical industry. For sealing, or prevention of rust, corrosion and tarnishing on various surfaces. Seals electrical circuit boards and electrical connections. It's a dry formula meaning it doesn't evaporate or get broken down by exposure to moisture. 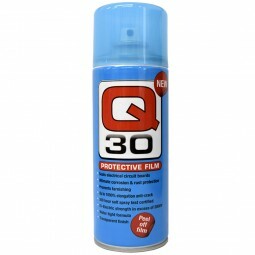 Q30 can be used to protect any metal-based surface from corrosion. Protect brass hinges, handles and hardware that are prone to tarnishing. Seal leaking skylights by spraying a few coats on all suspected leaking joints. Can also be used to Seal electrical light fittings from corrosion. Simply spray a few coats in the connection and on the bulb fitting.